Annandale is a very diverse mid-sized city located in Fairfax County Virginia in the Greater Washington DC region. It is known for its friendliness and its great diversity in its demographics. The town is populated by white collar and blue collar workers, dominated by office and administrative workers, salespeople and various types of service providers. There are many different cultures represented in the citizenry of Annandale, and the city, comprised of just over 46,000 people in total, is a perfect snapshot of the American melting pot. As a perfect symbol of the great diversity in demographics, ethnicity and culture, downtown Annandale is known as Koreatown with nearly 1000 Korean owned businesses and over 5 dozen excellent Korean restaurants. The city itself offers an extremely diverse culture, not dominated by any particular ethnicity. It is a peaceful city with excellent transportation routes, notably Virginia Route 236, which bisects the town, and the nearby Capital Beltway. Property values are excellent, as they are among the highest in the state of Virginia and the highest in the United States. The city itself sits right along Lake Accotink, which is surrounded by a beautiful park that is filled with bike and hiking trails. The views and vistas in the region are incredible. Also the crime rates are extremely low in Annandale, which is important when raising a family. Living in a safe community with good schools should be a must for any family with children. In this case Annandale meets all criteria, the schools are great, the town is peaceful and the crime rate is low. 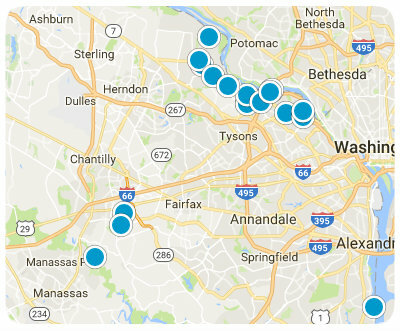 In fact, Annandale posts less than 50 violent crimes a year, which is great for a city of its size. Curious to know what homes are selling in your neighborhood? Sign up here for Annandale Market Report to be up to date on real estate market statistics. Wondering how much your Annandale home is worth? Learn more here!